Damn... one for next year? I was thinking about getting a road bike for this summer to suppliment my training for Mountain Biking, but I am still a little unsure. Does riding a road bike help with the fitness for mountain biking? My main concern is that the riding position is different with the 2 disciplines. Also im not sure about all the road bike gear, i.e what to look for in a bike. I think my choices within my budget are between Tiagra and 105 groupset. My budget is about $1500. Very interested in riding this event, however there has been little interest Total of 10 riders, this event might fail? I'm sure us Nobs could make a few teams? from what I understand, Shimano Tiagra vs. 105 is an age old subject. I'm trying to build my first bike (Surly Pacer frame) which is a steel 'quick'ish frame. I've got the choice to stick either of these group sets on the bike. My preference would be a Tiagra for the hard-wearing, and a a 10speed because it's in vogue and feel sure there is some benefit in having the extra range of gears. Contador - who has won three Tour de France championships – tested positive on July 21 this year with the analysis revealing traces of clenbuterol. Contador has blamed food contamination for his positive test result. Anyone fancy a road ride tomorrow (Sunday)? Starting at around Forest Way, ride down to Palm Beach> Ferry to Ettalong Beach> Woy Woy> Kariong> Pacific Highway> Pie in the sky> Hornsby> Monavale road> back to the start. It's about 122KM's all up, with around 1800mtrs climbing. I have just added a road bike to my arsenal and am very much enjoying the chance to ride each day (commute to the city) to supplement my weekend mtb rides. One thing that is already driving me nuts is flat tyres - in the last week I have had two. I am a big guy (6'4", 95kgs) so I have had my tyres pumped up to 100psi. I tried dropping the pressure to 90psi in the hope of lessening the chance of flats but still got another one today and the bike just feels sluggish. Is there something that I am missing here or is this just something I need to get used to? Hmmm... so how would these jerseys go down in Sydney? i know this is meant to be a mtb forum, but ahs anyone done sydney to gong charity ride? am thinking of doing it just wanted to get some info on it first....and is it doable on a hardtail with kenda nevegal 2.1s or should i look at switching to some slicks ...or at least something lighter? any info would be useful..
Was up at Terry Hills today doing Salvation Tracks and Towlers Bay on the mountain bike. Noticed the significant number of roadies out there today and was wondering is there a good loop out that way to do ? Not done a lot of road riding before but assume there must be a good / safe ride up there given the numbers of people. Any info would appreciated ! Didn't know about this one, did the cameras miss it? Well as most will know Schleck lost the yellow jersey last night due to a mechanical. He was just short of the top of the final climb when he dropped a chain. He struggled for 20 seconds or so to get it back on. In that time Contador continued and gained time on the descent to finish with a 39 second advantage and therefore taking the lead in the race. Need a suggestion for a longer commute to work, I am in North Willoughby and work in the City and currently go via the Cycle Path into the City which about 10-11km each eay, however I am looking to add in some more distance to that ride each morning as tbh, 10km isnt very much. Any suggestion for where I could go, trying to avoid as much of the rush hour traffic as possible? Anyone keen for a 100km odd ride around the Northern Beaches a-la http://www.bikely.com/maps/bike-path/100km-Tour-...? I have ridden parts of this and in a clockwise direction it is probably not too bad (McCarr's Creek Road is definitely more difficult from Bayview!). I have my new road bike and whilst the mtb is out of action and I need some fitness I am keen for a decent hit out. Pace will probably nothing too speedy but definitely not slow and I don't really plan to stop anywhere for any great amount of time, maybe just fill up the water bottle, visit the bathroom etc. Look at the results, look where all the Saxo riders came in. Or maybe they are all just rooted? 1. Jens Voigt : Having been in the breakaway most of the day, dropped off to 'wait' for Schleck on Col de la Madeleine and then paced him (and Contador) for a couple kays. 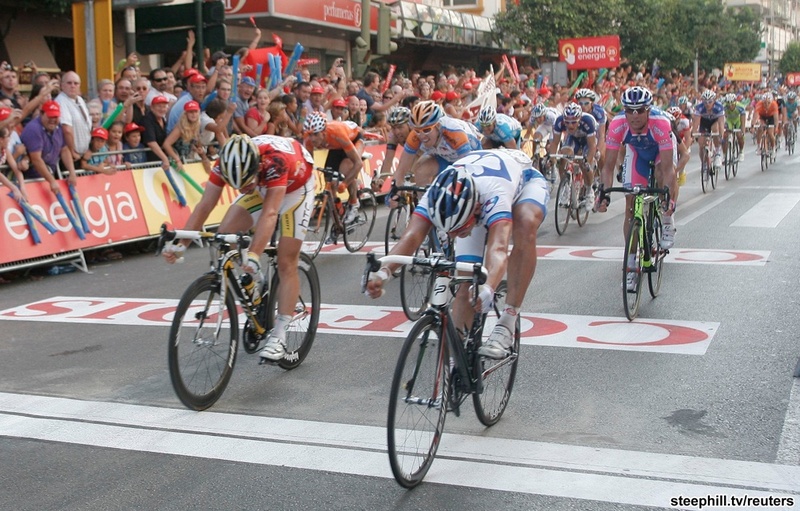 Contador, realising it would be a bad idea to have Voigt with them over the top put in a move and unhitched Voigt. You could just see the fight Voigt put in though - once he realised that was it, he just seemed to stop dead on the hill with nothing left.